MOST OF THE MEALS CAN FEED A FAMILY UP TO TWO-FIVE PEOPLE; fantastic food fantastic portions fantastic environment!! Come have a bite and a drink with other adults with albinism. Cost: Each person is responsible for purchasing their food and beverages. Wear white clothes and bring a white rose. Please indicate on the FB event page whether you are going or contact me via email to ensure enough seating at the restaurant. Individuals responsible for own food and drink purchase. Details: Quick meet up for anyone interested; we’ll be set up by the playground area for a short time to chat and connect with others in the community. All our welcome! A few light snacks provided. Organizer: McLean Bible Church in partnership with The Salif Keita Global Foundation Inc.
IAAD is June 13th! How will you celebrate IAAD 2018? Last year, our community showed up well with walks, meet ups, picnics and even a benefit fashion show. Are you hosting an event for International Albinism Awareness Day? Let NOAH help spread the word about your celebration! Questions may be directed to iaad@albinism.org. 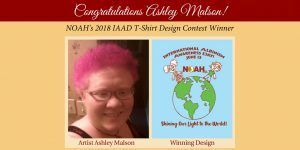 In honor of International Albinism Awareness Day 2018, “Shining Our Light to the World”, NOAH is thrilled to announce the new NOAH IAAD t-shirt designed by Ashley Malson! Pre-orders for t-shirts closed May 14th. Following the fulfillment of orders, any remaining inventory will be available through the NOAH Store. T-shirts are being offered in short and long sleeved, youth XS through Adult XXXL. $15 for short sleeve, $20 for long sleeve, for XXL +$2.00 and XXXL +$4.00. US S&H is included, email info@albinism.org for international quotes. This is a pre-order – shirts will be shipped at the end of May for delivery in time for IAAD June 13th. On November 18, 2014, the United Nations’ General Assembly adopted a resolution establishing June 13th as International Albinism Awareness Day. This historic resolution confirmed the global focus on albinism advocacy. 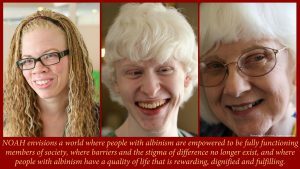 NOAH joins with the worldwide albinism community in encouraging everyone to celebrate and promote albinism awareness on Wednesday, June 13, 2018. The late Ambassador of the Mission of Somalia to the U.N., Geneva, Yusuf Mohamed Ismail Bari-Bari, led the effort to pass the resolution in cooperation with Under the Same Sun, an organization that promotes and protects the rights of people with albinism, particularly in Africa. Shortly thereafter, NOAH participated in a U.N. “side event” to celebrate the adoption of the resolution. The late Excellency Bari-Bari made opening and closing remarks at the event, which included sharing a story with Pope Francis in which he informed the Pontiff of the atrocities committed against people with albinism in Africa. Many other dignitaries also attended the event, and each made brief statements in support of the resolution. These attendees included representatives from the U.N. delegations from Italy, Israel, Canada and the United States, the U.N. Special Representative on Violence against Children, a representative from UNICEF, and several key individuals in the albinism community. 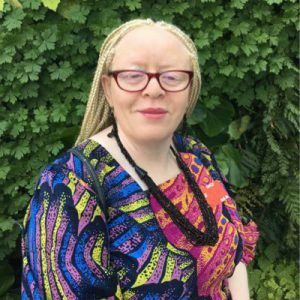 This year, we are happy to welcome back Natalie Devora as she leads the campaign to Shine The Light for International Albinism Awareness Day. 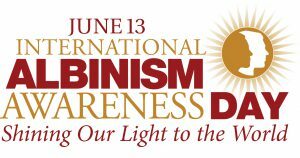 Natalie will be sharing more details soon about even more ways you can participate in this celebration with NOAH and others in the albinism community around the world. Don’t forget to check out – and follow! – NOAH on Facebook, YouTube, Twitter and Instagram!